Antique quilt, circa 1875, with Floating Sunburst blocks from the 1840s chintz, put together and finished about 1875. There are 21 complete blocks each with 21 narrow white rays and wider chintz print rays. The center of each Sunburst is about 4" in diameter, and completed circle is 8.5" in diameter. 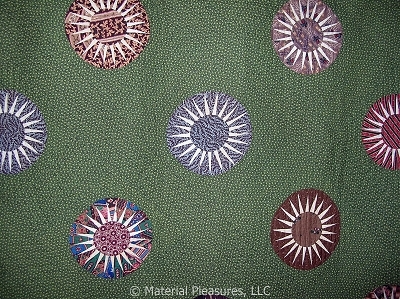 They are then pieced into a green print fabric 10" square. They are set on point, set with alternate squares and then sashed with the same green print, 4" wide. There are half blocks around the edges, and 2 quarter blocks in 2 corners. Each half matches to another half. The binding is the same green print, and is applied by machine. It is hand quilted in 1" parallel lines, each square in an alternate direction. In very good condition with no holes, tears, odors, or spots. I do not think it has ever been used of washed. There is some light spotting on the back, very faint.